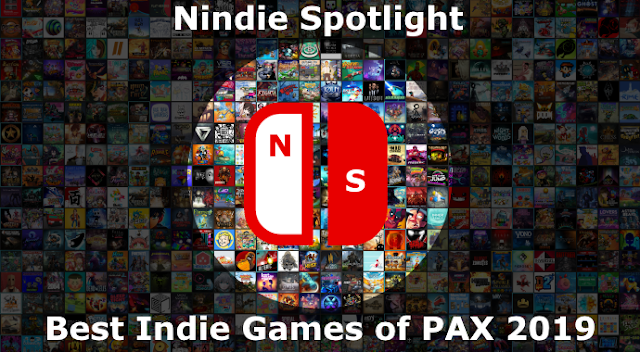 The folks at 10 Tons certainly have a knack for creating compelling twin-stick shooters but they do dabble in some other genre varieties. Xenoraid is their take on a more classic arcade-style space shooter but it still manages to incorporate some of their signature style as well. Over the course of your campaign, or in the game’s more straight-up Survival mode, a key element to the experience is allocation of credits towards a variety of upgrades to your individual ships or your squad as a whole. This gives it a blend of action and strategy that help elevate it a little bit in terms of choice, variety, and challenge. Aliens are coming and it is your job to neutralize the immediate threat and then to take the battle back to them… or something like that. In the main Campaign there is a bit of story going on but for the most part it is nothing surprising and just window dressing for the action. As you begin every mission you’ll have an opportunity to spend the credits you’ve earned to repair (highly recommended) or enhance your ships. While perhaps the variety of upgrades isn’t as elaborate or creative as in other 10 Tons titles you will have different ways of choosing to upgrade the guns, secondary weapons, or defenses of your ships and the choices you can make, especially as you get to later missions, will matter. While throwing upgrades at your favorite type of ship may make it incredibly powerful once it begins taking damage if will quickly become a liability as you’ll either need to stop using it or risk it being destroyed, and unfortunately in the Campaign those losses are for keeps (though this can be mitigated by upgrade choices you can make as well)! What helps to elevate Xenoraid is this layering of strategy: One part in the phase of choosing upgrades, and another during gameplay. You’ll control the squad of 4 ships, though only ever 1 at a time with the buttons on the controller choosing which one to use. Each will generally have different offensive capabilities and you’ll be facing waves of enemy fighters and capital ships that tend to have strengths and weaknesses against certain ones. Retaining everyone in your squad is crucial to long-term survival so you’ll need to constantly change which ship you’re actively using to either suit the types of enemies you’re facing or to simply try to keep some from being destroyed. This does do an excellent job of ratcheting up the tension as even in easier missions it isn’t unusual for at least one of your ships to take a beating. The ballet of using the most effective ships at the right time or settling in to take down a capital ship with one you’re not as afraid to lose and making it work helps keep things interesting. In Survival mode since you’re just trying to last as long as you can before finally dying this concept is taken to the next level and does tend to change up your tactics as you begin to decide which ships you’re most willing to lose first. While the style of play is interesting and things can get intense there’s something in the pacing of the game overall that feels a bit too slow. This would probably risk the game being too difficult, and it already can get pretty hairy at times, but overall I just would have preferred things ramping up more quickly somehow. The somewhat vanilla story with exchanges between characters I don’t really know or care about contributes to this but even within missions the tendency is more towards bursts and skirmishes rather than more sustained waves. While I don’t have an issue with the stakes I could also see where people could be aggravated by them, let’s just say that you really want to take care to rotate your ships and keep track of their status, losing them is a possibility and it can be a big problem (though again there are perks that can help you deal with this better). 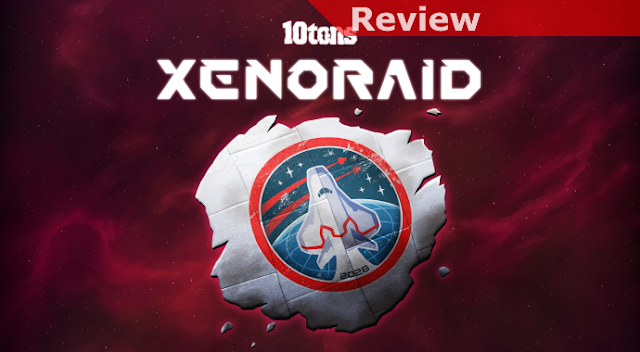 Overall I like Xenoraid and appreciate what it has set out to do, but at the same time I’m not blown away by it. 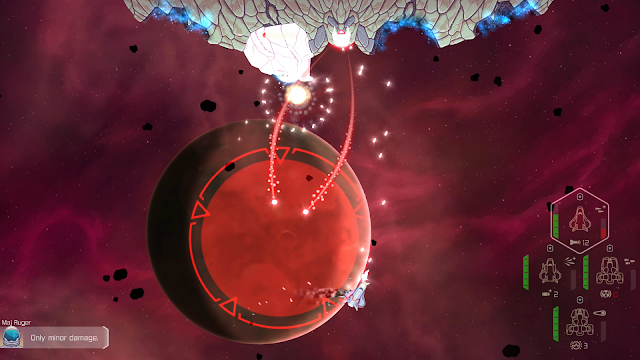 Of course a bit part of the challenge is that 10 Tons has released a number of excellent shooters on the system already so they’re essentially competing with themselves. 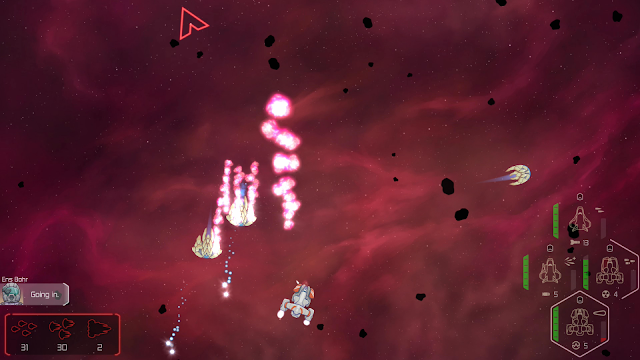 The break in overall style is a positive if you enjoy shooters but want something with a different flavor, but I’d say Xenoraid is a well-made game that I’m just not that passionate about.